Get these high-quality building tools on sale from BTE. Shipping in US is FREE when ordered with any BTE kit! 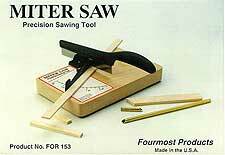 Package includes saw with a hardened-steel blade. The base features a molded-nylon blade guide and adjustable fence that is easy to position at any angle. 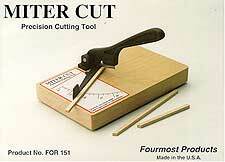 It is perfect for cutting the angled sticks in the Flyin' King fuselage and tail. The kit plans show the exact angle to use. We have been using ours at BTE for over fifteen years and it's still going strong. 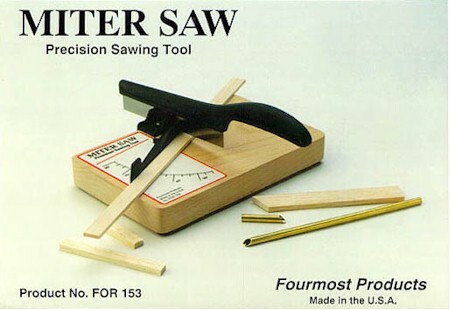 Replacement saw blades are available from Fourmost if you ever need them (we haven't!). Cuts up to 1/2" thick wood. The chopper! The Miter Cut features a built-in razor blade (standard, single-edge) that slices cleanly through the wood. The actual cut is cleaner than the Miter Saw, but this one works best on wood up to about 3/16" thick. (It will cut 1/4", but leaves a small indentation). Still, this is a handy tool for smaller models with smaller sticks. The molded nylon fence can be positioned accurately using the angle markings, and features a positive stop at 90 degrees. Comes with extra blades. 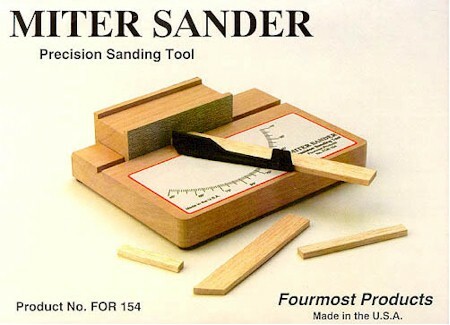 This clever tool features an adjustable fence and a precision-made sanding block that slides back and forth in grooves. This tool will deliver that extra level of accuracy demanded by top builders. The sanding block comes with two different grits of sandpaper, which is easy to replace when needed. Actually, you can double the life of your sandpaper just by flipping the block over! We use our Miter Sander extensively when building UAVs here at BTE.